The twin GRAIL spacecraft impacted the Moon on 17 December 2012, LROC was able to image the impact craters on 28 February 2013 showing them both to be about 5 meters in diameter. Upper panels show the area before the impact; lower panels after the impact. Arrows point to crater locations [NASA/GSFC/Arizona State University]. The Gravity Recovery and Interior Laboratory (GRAIL) mission ended on 17 December 2012 at 14:28 PST (-8 hrs. relative to Universal Time) when the two spacecraft GRAIL A (Ebb) and GRAIL B (Flow) impacted the Moon. Both impact sites lie on the southern slope of an unnamed massif (mountain) that lies south of the crater Mouchez and northeast of the crater Philolaus. The massif stands as much as 2500 m above the surrounding plains. The impact sites are at an elevation of about 750 m and 1040 m, respectively, about 460-750 m below the summit. Recently NASA named the GRAIL impact site after America’s first woman in space – Sally Ride. The two GRAIL spacecraft were relatively small – cubes about the size of a washing machine with a mass of about 200 kg (441 lbs) at the time of impact. When they arrived at the Moon their mass was closer to 278 kg (619 lbs), but about 78 kg (172 lbs) of that was fuel consumed during lunar operations. Both spacecraft impacted at very low angles (~2° to the horizontal) at about 1600 m/s (faster than a speeding bullet) into a fairly steep slope! 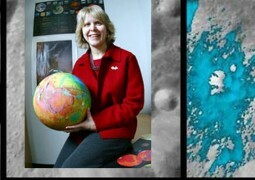 LROC images reveal that both spacecraft formed craters about 5 m (15 ft) in diameter. Surprisingly, the ejecta around both craters is dark and irregularly distributed around the crater; there is little ejecta to the south – the direction from which the spacecraft were traveling. GRAIL A site seen before and after the impact event. Crater center is located at 75.609°N, 333.407°E [NASA/GSFC/Arizona State University]. Typically ejecta from craters has a higher reflectance than the target material (think of the rays of Tycho). This normal contrast is due to the excavation of fresh (or immature) soil from beneath a more mature, weathered layer. As the lunar regolith is exposed to the vacuum of space, it suffers exposure to cosmic radiation, solar wind bombardment, and micrometeorite impacts. Slowly over time, these processes tend to darken the soil. Thus, if you dig down beneath the surface you will find higher reflectance soil. 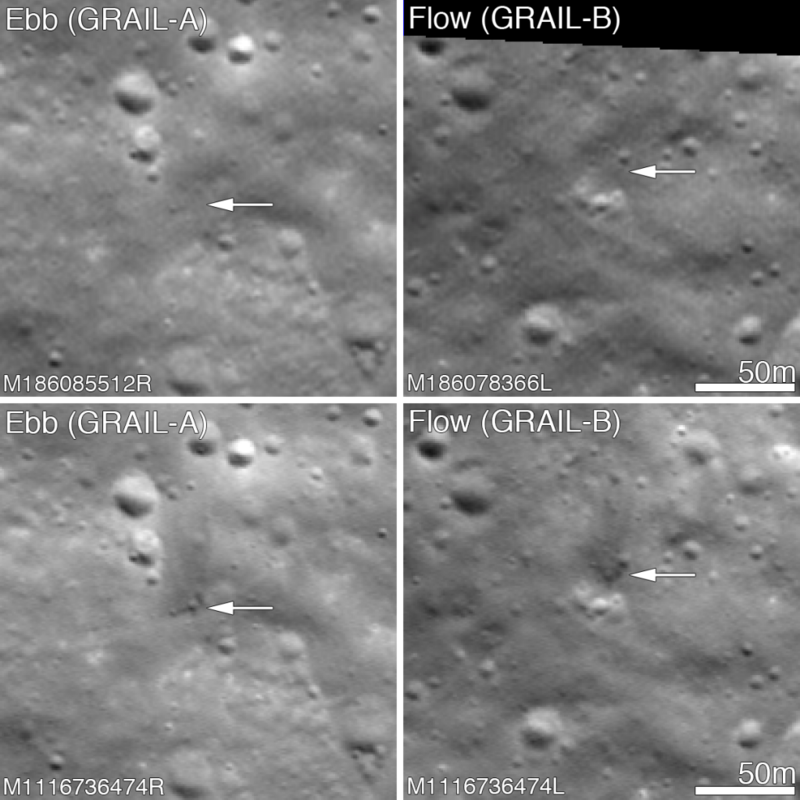 GRAIL B site seen before and after impact event. Crater center is located at 75.651°N, 333.168°E [NASA/GSFC/Arizona State University]. So why do both GRAIL craters exhibit low reflectance rays? Perhaps we are seeing carbon from the spacecraft. The structure was made of a cyanate ester composite (carbon rich) and other materials also had carbon as primary compounds. Additionally, there was about 0.5 kg (1.1 lbs) of fuel remaining in each spacecraft. Due to the energy of impact, the carbon from these varied sources may have been released and mixed with and coated the ejecta. It takes only a very small amount of carbon to darken a material, recall in art class when you put just a few drops of black paint into a lighter color and it went all muddy. But right now we do not know for sure the cause of this interesting anomaly! 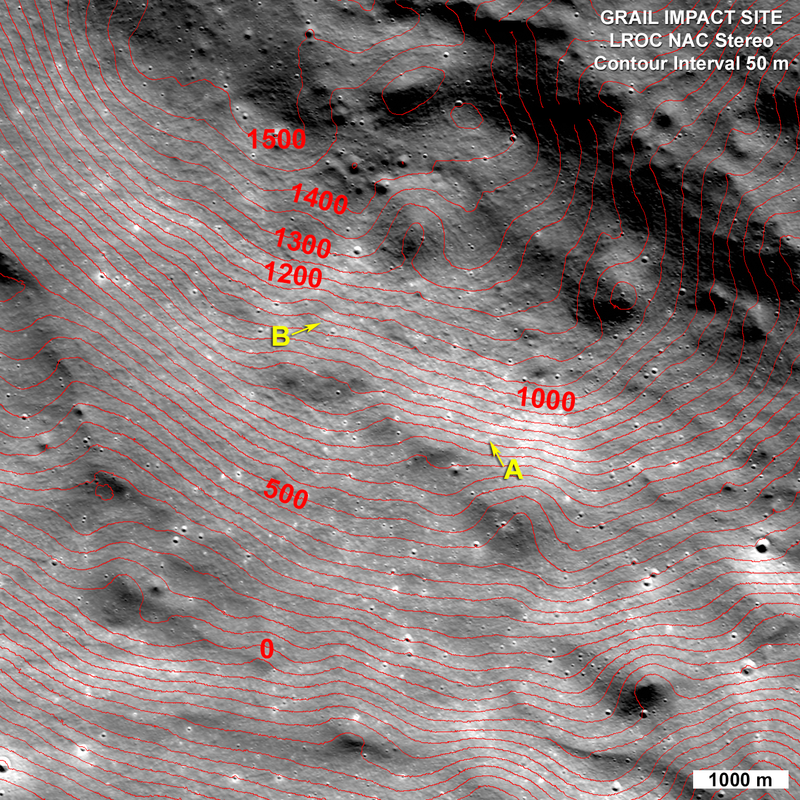 On 28 February 2013 the LROC obtained a stereo pair for the impact area and from these images the LROC team produced a controlled preliminary topographic map. From the stereo model latitude, longitude and elevation were derived for each impact crater: GRAIL A 75.609°N, 333.407°E, 750 meters and for GRAIL B 75.651°N, 333.168°E, 1040 meters. The local slope of the mountain at the point of impact was 23° for GRAIL A and 19° for GRAIL B. As knowledge of the spacecraft position is refined the LROC team will update these coordinates. The two impact craters are about 2210 m apart; GRAIL B impacted about 20 seconds after GRAIL A at a site to the northwest of GRAIL A.
LROC NAC stereo derived topographic map of the GRAIL Impact area, map is 8400 meters wide, north is up [NASA/GSFC/Arizona State University]. The Geological Society of America awarded M. Darby Dyar of SSERVI’s RIS4E team with the prestigious 2016 Gilbert Award.